It’s not uncommon for someone with depression to also suffer from an anxiety disorder or vice versa. Almost half of those diagnosed with depression are also diagnosed with an anxiety disorder. an estimated 19.1% of U.S. adults had any anxiety disorder in the past year. Past year prevalence of any anxiety disorder was higher for females (23.4%) than for males (14.3%). An estimated 31.1% of U.S. adults experience any anxiety disorder at some time in their lives. An estimated 16.2 million adults in the United States had at least one major depressive episode. This number represented 6.7% of all U.S. adults. The prevalence of major depressive episode was higher among adult females (8.5%) compared to males (4.8%). The prevalence of adults with a major depressive episode was highest among individuals aged 18-25 (10.9%). The prevalence of major depressive episode was highest among adults reporting two or races (10.5%). You don’t have to live a life full of anxiety or plagued by depression. The good news is…there’s hope. 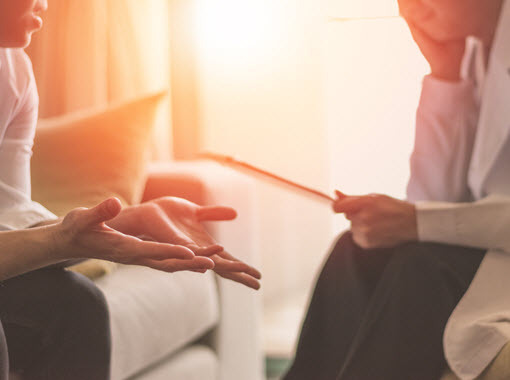 Parkside Psychotherapy offers Cognitive Behavioral Therapy (CBT), Dialectical Behavior Therapy (DBT), Clinical Hypnotherapy and traditional talk therapy for the treatment of anxiety and depression. We can also offer referrals to psychiatric professionals if a client would also like to pursue pharmacological assistance to treat their anxiety and/or depression. Cognitive behavioral therapy (CBT) is the most widely-used therapy for anxiety disorders. It has been proven effective in treating phobias, social anxiety disorder, generalized anxiety disorder, and panic disorder, among many other conditions. Cognitive therapy – how negative thoughts, or cognitions, contribute to anxiety. Behavior therapy – how you behave and react in situations that trigger anxiety. The basic premise of CBT is that your thoughts—not external events—affect the way you feel. In other words, it’s not the situation that determines how you feel, but your perception of the situation. CBT for depression helps you identify negative or false thoughts and replace those thoughts with healthier, more realistic and effective thoughts. CBT makes you aware you have these negative/false thoughts. Then it teaches you to change them for more positive thoughts. The change in your attitude leads to a change in your feelings and then your behavior. This can help ease your depression. DBT or Dialectical Behavior Therapy is modified CBT, which includes using mindfulness, interpersonal skills, distress tolerance skills and emotion regulation to provide you with coping mechanisms for anxiety or depression. Clinical Hypnotherapy can also be highly effective when used with anxiety disorders and depression. Please see (link to my hypo page?) for more information about clinical hypnotherapy. Traditional talk therapy allows you to discuss your specific anxiety issues and the roots of your depression and process them with a trained therapist. We will tailor a treatment approach that combines one or more of the above therapeutic interventions to meet your specific needs. Call Suzanne today to schedule a free telephone consultation and get help for your anxiety or depression today!